Allergic rhinitis (AR), more commonly known as hay fever, is a chronic type of rhinitis caused by exposure of a hypersensitive individual to a specific allergen. 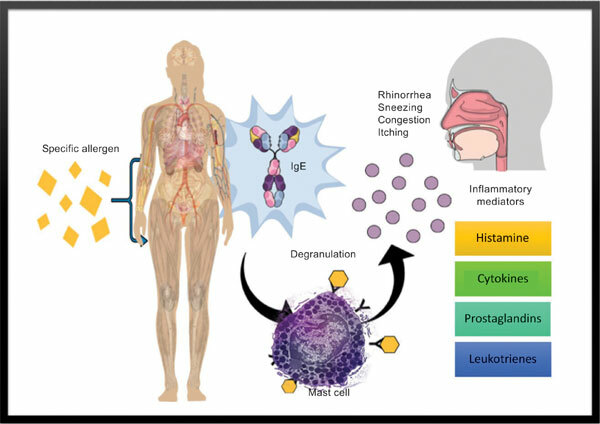 This response triggers the production of IgE antibodies, which in turn, binds to mast cells resulting in their degranulation, and subsequent release of inflammatory mediators (like histamine) within the bloodstream, leading to multiple nasal symptoms such as rhinorrhea, sneezing, nasal congestion and itching. For many years, AR has been a widely neglected and mistreated disorder where treatment is primarily based on the relief of symptoms, mostly treated with accessible over the counter drugs, so normally patients will tend to rely on self-medication before seeking proper medical attention. This understatement may be due to the fact that the disease is not ascribed to mortality. Nevertheless, this disease can have a significant impact on the quality of life of the patient. AR can be considered the second greatest cause of impairment of work productivity in the life of an afflicted individual. It is even worse than the impairment caused by other major diseases such as hypertension and diabetes mellitus. This review aims to present an overview of available important pharmacologic treatment options as well as alternative interventions, such as acupuncture/moxibustion, for the treatment of AR and its symptoms. Acupuncture, allergic rhinitis, corticosteroids, hay fever, moxibustion, treatment.